We all love a good superhero crossover. Marvel’s The Defenders is just that. In this series set in the Marvel Cinematic Universe, the superheroes team up to form The Defenders. 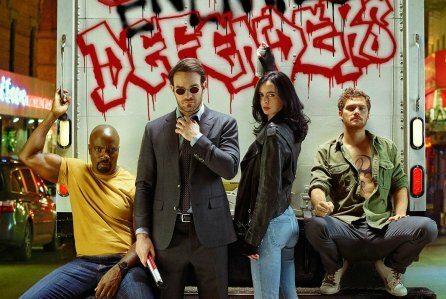 They include: Jessica Jones (Krysten Ritter), Luke Cage (Mike Colter), Iron Fist (Finn Jones), and Daredevil (Charlie Cox). They all work together to battle the recurring evil group known as the The Hand. The Hand is led by the evil crime boss Madame Gao, who appears in Iron Fist and briefly in Daredevil. Each of the heroes bring unique qualities and talents to the table, making this miniseries a very interesting one. You can see filming locations from The Defenders on The Super Tour of NYC! The timeline of the series picks up from the second season of Daredevil and about a month after the first season of Iron Fist. To better understand the miniseries, it is recommended that you watch each of the heroes’ own series on Netflix. The Defenders begins with a focus on Iron Fist and his pursuit of the Hand. He travels to New York, which leads to him eventually teaming up with Luke Cage and the other heroes. As the show progresses, we witness how each of the heroes pair with each other and see their contributions to the fight for justice. Central Park is where a lot of fighting scenes take place, but its first appearance in The Defenders is where Madame Gao (Wai Ching Ho) and Alexandra (Sigourney Weaver) have a private meeting. You can see this sight and others on the Central Park TV & Movie Sites Walking Tour.